The TD Canada Trust iPhone app has been updated to version 2.4.0 to support iOS 5, and also introduce the ability to send and receive email money transfers through the re-branded Interac e-Transfer (a previous update in April introduced Interac Email Money Transfer). The TD app is a fully featured banking app to allow users to pay bills, transfer money, monitor investments, find ATM locations, and more. 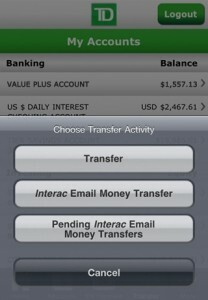 Since its release in April of 2010, the TD Canada Trust iPhone app is just one of many popular Canadian banking apps. Click here to download the TD Canada iPhone app, it’s free.